Her knight in shining armour? Katherine Wilder will do anything to escape her forced marriage—even ask Brandt Radcliffe to kidnap her! Only she doesn’t expect a man so disreputable to say no! With her father now desperate to marry her off to line his own pockets, widower Brandt has become her reluctant protector—and it seems the only way he can do that is to marry her himself…! This is a wonderfully, entertaining and original story, it isn’t your typical marriage of convenience in fact I saw it more like enemies to lovers which really is my all-time favourite trope. And this one is a doozy! Katherine is facing a forced marriage to a vile and repulsive man, who she not only finds undeniably horrible, but she is terrified of him and what he is capable of. She will do anything to escape, so she hatches an ingenious plan to finally be free. She plans to be kidnapped and held for ransom and she enlists the help of notorious scoundrel; Brandt Radcliffe – don’t you just love that name! Katherine is a real spirited young woman, the way she goes out and seeks the volatile and grizzly Brandt within the London slums speaks of her fierce and resilient nature. She is bossy, clever and I think a little naïve, plus she is scared. She is terrified of what will happen to her and more importantly her sister, she will do anything to protect them both even go out of her way and approach the dangerously handsome Brandt. I like Katherine, she is has a huge imagination and an equally huge sense of her self-worth which she likes to use both, yet she is very loyal to her family and those she cares about. But if she thought that the all-out bad boy will do as she says, she may have to re-think her plan as Brandt cannot think of anything worse than risking his neck for a spoilt brat – which is actually what he thinks of her at first. So, he changes the initial plan, one thing leads to another and soon Brandt realises that she is a danger not just to him but for herself and the only way to protect her is to marry her – much to his disdain! What a wonderfully, brooding character Brandt is, he is very much a reluctant hero. After the death of his wife; Mary, Brandt has been living on the outskirts of society. He likes to be anonymous, the only way he can dull the pain of her death is to detach himself from people and drown himself in drink. That is until he meets the irritating fire-brand who wears the most ridiculous hats – Brandt’s thought’s not mine, I love how that one hat irritates the life out of him. Beneath that growly, drunken, highwayman sort of bluster there lies the heart of a good man. He is a complex and secretive man who seems to have lost all hope in ever being happy again, he misses his wife terribly but very unwilling to go down that path again – that is until a tiny but loud woman barges into his room! I love how original the storyline is, from page one where Brandt is rudely interrupted from his drunken stupor it is engaging and fun to read. I love the bickering between Katherine and Brandt, they have a great chemistry, Ms Tyner has done a wonderful job at bringing these two completely different personalities together. This is definitely a page-turner, the developing romance between Katherine and Brandt is fun and romantic but I particularly like it when they are hostile with one and other which is very enjoyable to read. Saying I Do To the Scoundrel is available now and can be purchased at Amazon. This entry was posted in ARC, Historical Romance, Mills and Boon/Harlequin, Regency, Reviews and tagged ARC, Harlequin, Historical Romance, Liz Tyner, Mills and Boon, Review, Saying I Do To the Scoundrel. The scoundrel of society …has compromised the Vicar’s daughter! When scandalous Fenton Foxworthy is a beaten and left for dead, he’s rescued by demure Vicars daughter Rebecca Whitelow. Fox is a cynical rake, whose outrageous propositions are the talk of the ton – but his injuries are so great that Rebecca mistakes him for the new village Vicar! Too late, Rebecca realises her error…She’s been compromised into a hasty marriage! Well, what can I say about this book, bar fabulous? In it’s entirety this is a very simple ‘Marriage of Convenience’ story but it is the circumstances behind why they must marry and the character’s themselves that keeps you gripped from the start. I also found that Redeeming the Roguish Rake to be much more than the ‘Marriage of Convenience’ trope, this is a story of second chances – in the case of Fox; third and fourth chances – about moving on and more than that, it is a story about learning to love and trust. Fenton Foxworthy (Isn’t that the best name, ever?) is the rake of the ton, he is scandal in a pristine evening suit, he has got the blackest reputation and is notorious for not just dallying for with other men’s wives, but he is a dab-hand at proposing to every married/widowed woman he can. But Fox is getting bored, he wants something more than just the routine drinking, gambling and bed hopping so to get his mind back on track and figure out where he goes from here he heads off to his ancestral home – firstly making sure that he will have the house to himself first – on route, Fox is set upon by a gang who after assaulting him leave him for dead at the side of the road. Fox really is the most scoundrelly (is that a word? – never mind!) vein rake that I have ever met. When we first are introduced to him I will admit that I was in two frames of mind about him, Tyner does work really hard to make this man more and more likable as the story unfolds. He is one of those strange creatures of the world that grows on you the more you are exposed to it – I felt like I really didn’t want to like him, that there wasn’t anything good about this man, but he soon turned my view of him around with his unusual charm. He could walk out the door. He could! Then she kissed his mottled misshapen, un-shaven cheek. Damn her! He shut his eyes, forcing anger to stay inside his body. How dare she be so good? I think deep down Fox is a lonely man, he wants to be liked and more than that I think he wants to be appreciated and he wants to feel like he is worth something. Unfortunately, up until he was attacked he has gone through life as though life itself owed him something and he could take and do what he wanted. But all that self-worth is thrown out the window when he meets Rebecca, who shows not just Fox himself but me as a reader that there is goodness in that cavernous selfish body of the heir to the earldom. He just wants to belong somewhere, and he finds that somewhere in Rebecca! Vicars daughter Rebecca Whitelow is as pure and good as you can get. She has got to the stage in her life where just tending to her father’s flock in the village is not enough for her. She wants more, she wants to be more than just a vicar’s daughter so when her father reveals to her that he will be pensioned off due to his age, Rebecca soon learns that the new vicar has been chosen with her in mind – he is a bachelor on the market for a wife and what better woman to be a vicars wife, than Rebecca! When she finds a severely wounded man by the side of the road who has been beaten to an inch of his life, she does what any good Christian does and takes him home. It is once he has woken up that her and her father jump to the conclusion that this man must be their new vicar – and also her soon to be betrothed. It’s only after he has recovered and when the Earl turns up with the actual vicar that their stranger’s identity is revealed. Rebecca is shocked to the core that the man she has fallen for is none other than the most debauched man in the country and he is the man she is forced to marry – not just for her reputation but for her father. Fox could have told Rebecca who he was at any time while she was caring for him, if he had been honest with her and then they wouldn’t have had to marry. But, being a selfish rake who always gets what he wants as soon as he saw Rebecca he wanted her. What he doesn’t expect is an uncommon urge to make her happy and protect her, putting someone else first is something that he is not accustomed to. Rebecca is so naive, she is too good and pure to be with the selfish Fox, he genuinely believes all that he is telling her – or to be precise all that he is not telling her as it’s her making all the presumptions about him he just didn’t put her straight until he had no choice. She is sort of stuck between a rock and a hard place, she wants to be free to help people, she knows that one way or another she will have to marry just to keep a roof over her father’s head but what she doesn’t want is to be stuck in a loveless marriage, which is exactly what she thinks will happen if she marries either one of the men in the picture; the actual vicar or Fox! He knelt on one knee, held her hands in his and looked into her eyes. “My Rebecca,” he said. They are so different she is lightness and spring sunshine and he is dark and fire and brimstone and at first, I wasn’t sure if they would work as a couple, as they are so different. Yet strangely enough once together all their differences tend to melt away and they fit. I really enjoyed this book, I like the chemistry between the character’s not just between Rebecca and Fox, but there are undercurrents of emotion between Fox and his father and the love between Rebecca and her father is palpable, so is the fact of how much she misses her mother. I do like Tyner’s writing I found she has a flare with words to draw you in to the story and their world and makes you feel what the characters are feeling. This is the first book I have read by Ms Tyner, I was hooked by the story and how it her style of writing just seamlessly flows, all the while taking you on a journey. Very enjoyable and highly recommended! The was a complimentary copy via the author in exchange for an honest review. Redeeming the Roguish Rake can be purchased at Amazon. 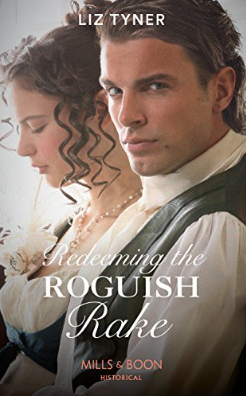 This entry was posted in Complimentary copy, Historical Romance, Mills and Boon/Harlequin, Regency, Reviews and tagged Complimentary copy, Harlequin, Historical Romance, Liz Tyner, Mills and Boon, Redeeming the Roguish Rake, Regency, Review.